Stained glass window, at the Cathedral Basilica of Saint Louis. This is a detail of one of the decorative windows in the west transept. 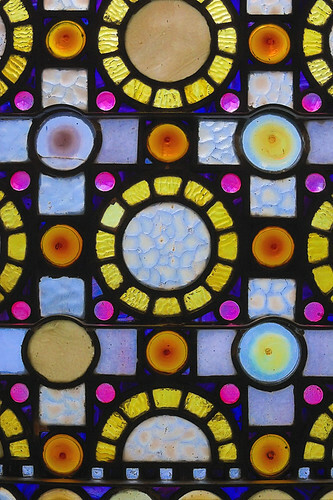 This is a couple of square feet of glass, located at about my eye level, and shows a variety of glass styles and colors. Fine detail, on a human scale, was once the norm in architecture. 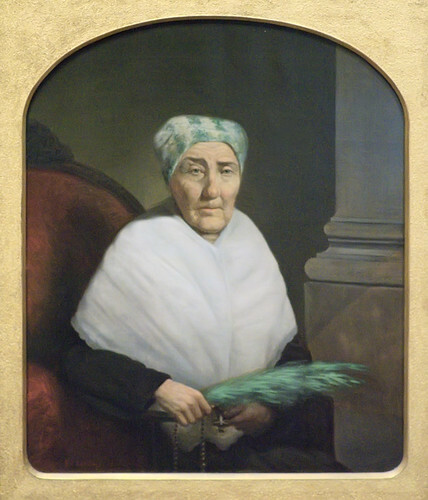 Painting of Madame Elizabeth Ortes, at the Missouri History Museum in Saint Louis. Mme. Ortes was an early Saint Louisian, born the same year of the City's founding in 1764. She sat for this portrait at age 102, and is shown here holding a Rosary and palm fronds. OH MY! Masonic symbols in a Catholic church! Click here to see a thread at Reddit. 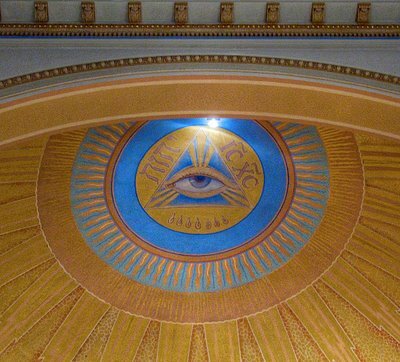 It discusses a possible Masonic/Catholic conspiracy, because of some symbolic art found in Catholic churches. Don't you love these discussions? But the Lodge got its symbols from the Church, not the other way around. The skull and crossbones, as seen in this photo at the Shrine of Saint Joseph in downtown Saint Louis, Missouri, is an obvious symbol for death. 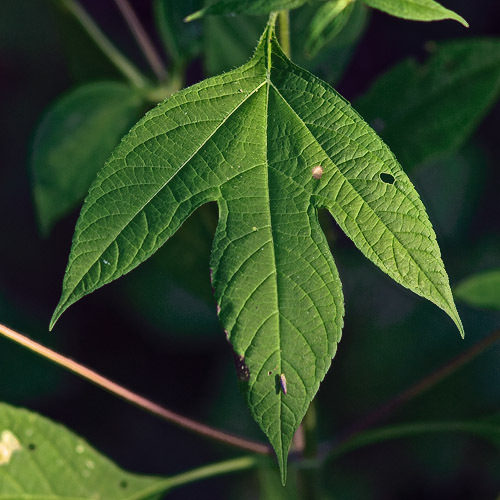 The butterfly is an ancient symbol for the resurrection: the lowly caterpillar enters a burial shroud-like chrysalis, and is reborn as a glorious butterfly, which ascends to the heavens. One of the Greek words for butterfly is psyche, which also is the Greek word for soul, which reinforces this symbolism. The monogram☧is made of the Greek letters chi, Χ and rho, Ρ, which are the first two letters in Χριστός, Christós, Christ. Therefore this is a symbol for the resurrection of Christ, and by implication, those who are united with Him. 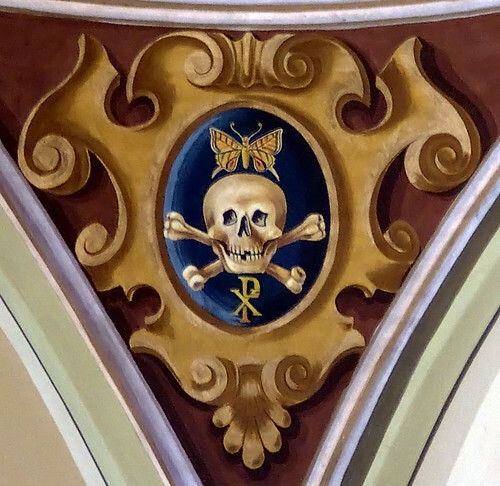 While the Church's use of the skull and crossbones has a supernatural meaning, this same symbol is also quite natural, and can be either a warning — “now is the time for action, for tomorrow we may die”, and also as a sign for danger — or a threat, as seen in piracy. The Eye of Providence symbol, a prominent element on the reverse of the Great Seal of the United States, is seen on the back of the one dollar bill. The symbolism on the Seal implies that Providence looks favorably on the creation of the Republic. Subsequently this became a patriotic symbol and was adopted by American Freemasonry, but it originally dates back to the age of Christendom. 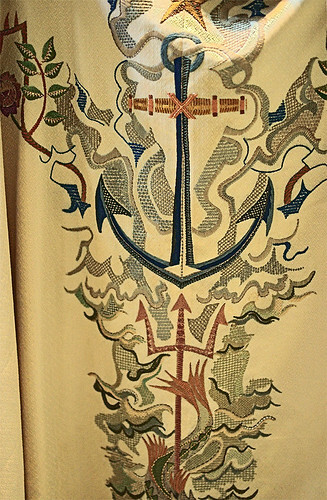 A similar symbol, seen at Our Lady of Sorrows Church, in Saint Louis. In traditional iconography, God the Father is given a triangular halo, representing the Holy Trinity. Included in this symbol is the Hebrew tetragrammaton יהוה,YHWH, the sacred and ineffable name of God; and the Greek abbreviation Iesùs Christòs. Under the Eye are seven tears, possibly symbolizing the seven dolors, or sorrows of Mary, although it may also be for the Seven Gifts of the Holy Spirit. This is an explicitly Trinitarian and Catholic symbol for God. This is also the symbol for the first of the famous ‘O Antiphons’ during the last week of Advent: O Sapientia, ‘Oh Wisdom’. This symbol is occasionally used in church art along with the other O Antiphon symbols. One commentator says this is an image of Christ between the two pillars of Masonry. The columns shown here look like mere decorative architectural elements in the Roman style, and certainly not like the unusual columns described in the Bible (1 Kings 7) . Solomon's Temple in Jerusalem had two copper-alloy columns placed on the porch: the left column named Boaz, and the right Jachin (it is thought that these were named after donors). These two columns are also used as symbols in Masonry — but with their order reversed, symbolizing the exit from the Temple, and by implication, the Church. There have always been heretics, evil-doers, and subversives in the Church, as Our Lord foretold in His parable of the weeds growing up with the wheat, and so I ask my dear readers to pray for me, a sinner. Undoubtably there has been, and is today, wicked art in Catholic churches. 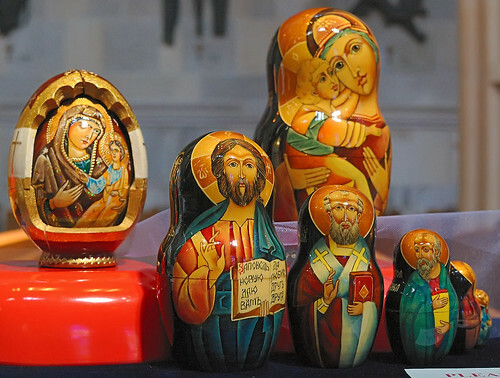 But it is iconoclasm, the stripping of icons and art from the churches, which has been a considerably bigger problem. But for a true conspiracy which infected the Church during the tumultuous years surrounding the Second Vatican Council, I suggest looking up the Propaganda Due affair. 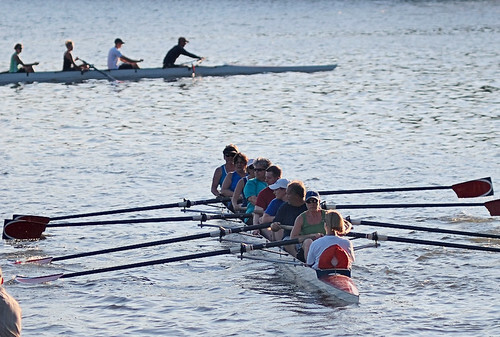 MEMBERS OF the Saint Louis Rowing Club, at Creve Coeur Lake, in Maryland Heights, Missouri. Chartered in 1875, this was one of nine rowing clubs which owned boathouses on the banks of the Mississippi River. These groups held regattas at Creve Coeur Lake, which was also the venue for the rowing competitions of the 1904 Olympic Games. These clubs generally folded or became social clubs by the mid-1950s, and only became active again in the sport with the infusion of new enthusiasts in 1983. No longer rowing on the river, the club now has a large permanent boathouse in a cove on the lake. Newbies getting a lesson in rowing. Boats like these were developed specifically for sport use. Inspired by ancient Greece, secular Victorians believed that team sports helped promote health and cooperation, and was a benign outlet for the competitive spirit. Muddled sentiments perhaps, but these beliefs play a large part in contemporary life: by the late 19th century, formal team sports were organized worldwide. Regular placement of the oars show that this is a more experienced group. According to Aristotle, the virtue of art — including the art of rowing — is seen in a person when his actions appear to be effortless and graceful. 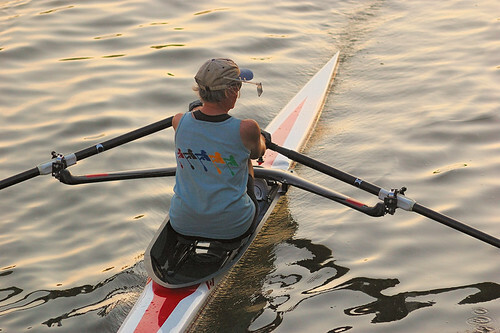 In the United States, rowing is often called ‘crew’. This type of boat, called a shell or fine boat, is long, very narrow, and is inherently unstable, requiring the active use of oars and rower's balance to keep it upright. 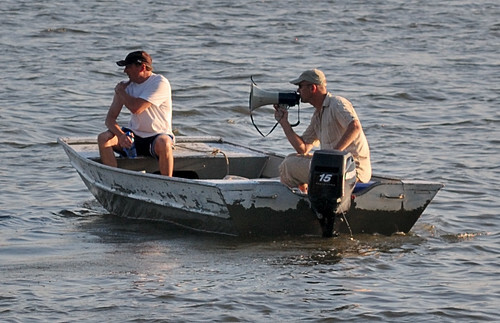 It can typically be used only in flat water. Other distinctive features of these boats are sliding seats and fixed pivots for the oars, which makes the transfer of power from the muscles to the oars very efficient. The design of these boats mean that they are good for only a single purpose: going fast. Unlike a canoe, they are impractical for general water transportation. This rower remarked that it was a bad day for boating: winds from the south (unusual for this region) generated waves that hit the boat broadside, which is a difficult and potentially dangerous situation. I was standing on a bridge over the water, giving me good camera angles! THE SAINT LOUIS Chapter of the American Institute of Architects is hosting a continuing education seminar, "An Evening with Emil Frei Studio", on Wednesday, September 2nd, 6:30 p.m., at the Steinberg Auditorium, Washington University. Cost is $20 for AIA members, $40 for all others. Call the AIA for more details. 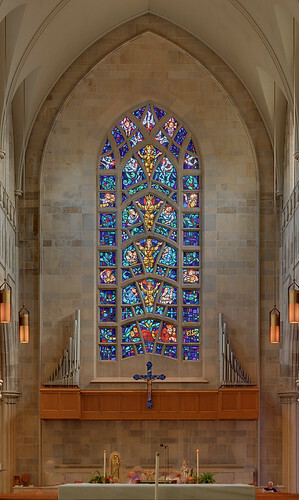 The firm of Emil Frei is famed for its stained glass and mosaics, and many Saint Louis area churches have Frei artwork. As the Church rediscovers its liturgical magnificence, firms like Frei ought to be getting much more business in the future. 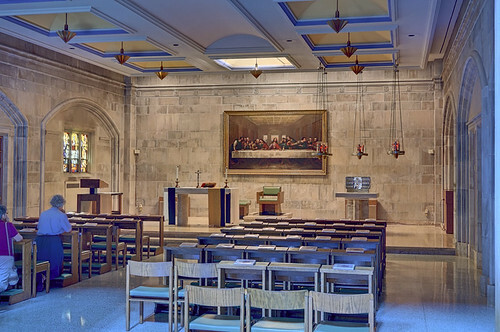 Local churches which include Frei art include: Saint Cecilia, Saint Anselm, Saint Francis Xavier, Saint Margaret of Scotland, Shrine of Our Lady of the Snows, Saint Anthony of Padua, Saint Elizabeth, Saint Francis de Sales, Our Lady of Lourdes, Saint Peter in Kirkwood, and many others. 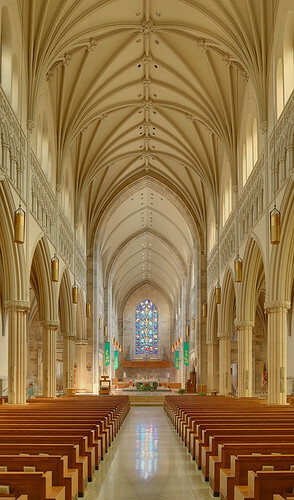 HERE ARE PHOTOS of Saint Peter's Cathedral, seat of the Diocese of Belleville. I visited the Cathedral on the Feast of the Assumption, to take photos of an exhibit of Marian art. While there, I took a few more photos. A view of the Cathedral exterior; this is not the best angle, but it was quite hot outside and I avoided walking around to get a better view. 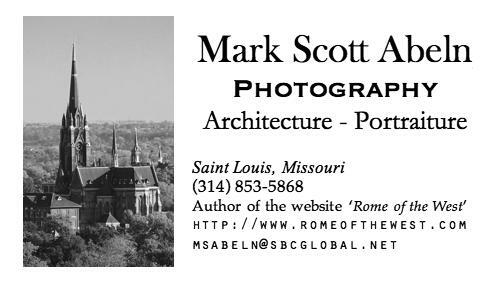 My older photos of the Cathedral are here and here, and those articles include additional historical information. Sunlight filtering through the stained glass windows filled this end of the cathedral with an unusual color. 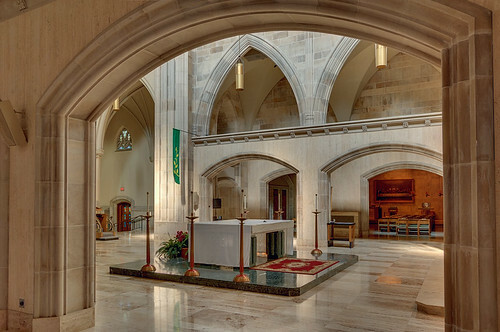 The sanctuary has a modern order and is located more towards the center of the church; in the background is the Blessed Sacrament chapel. A Marian shrine is adjacent to the sanctuary. 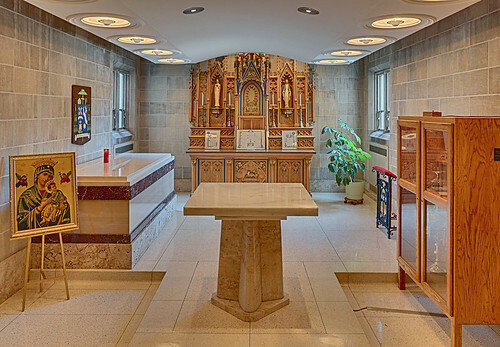 Blessed Sacrament chapel, where the confessionals are located. Tomb of Bishop Albert Rudolph Zuroweste. 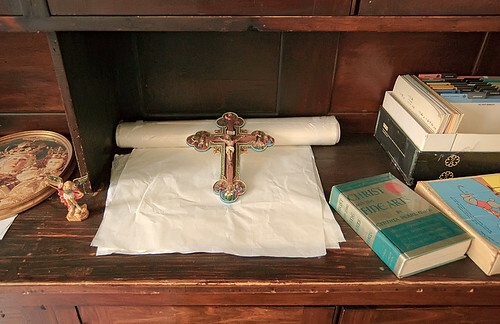 In front is a vesting table; in the back is an altar; to the right is a new cabinet containing items of historical interest: as I was taking this photo, I met the couple who made and donated the cabinet. Bishops' mitres. This form of hat dates back to the Jewish Temple in Jerusalem. The newer end of the cathedral dates from 1966. An exhibit of Marian art was on display here. You can see blurry images of people who were here during the camera's long exposure time. Modern stained glass window at the back of the church shows the Evangelists, with Kings Solomon and David, and Christ the King and the Holy Spirit at the top. Upon this Rock I will build My Church. 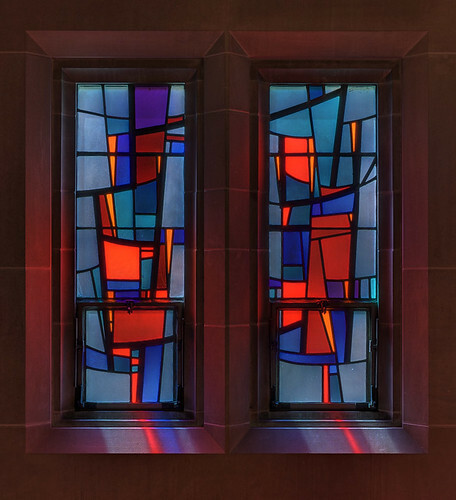 Non-representational stained glass window in the cry room. 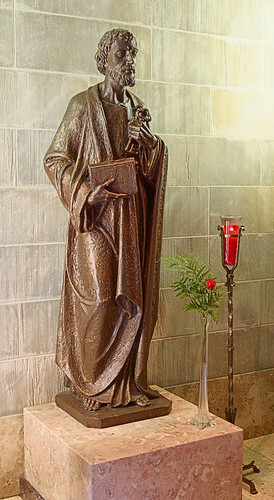 Saint Peter, holding a Bible and the Keys to the Kingdom of Heaven. 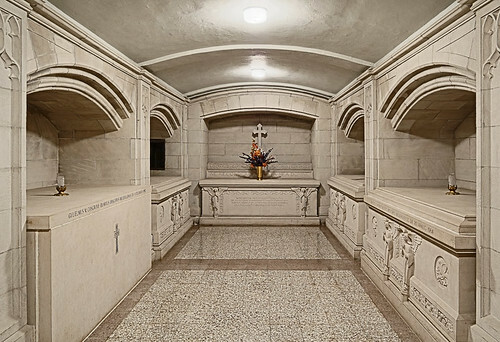 In a crypt under the church, tombs of bishops. The chapel in the convent of Saint Francis de Sales Oratory is undergoing restoration along with the rest of building, in anticipation of the arrival of Sister Marie of the Love of God, of the Adorers of the Royal Heart of Jesus Christ Sovereign Priest. Click here for more of my photos of the convent restoration, at Tradition for Tomorrow. Feast of Our Lady of Knock. 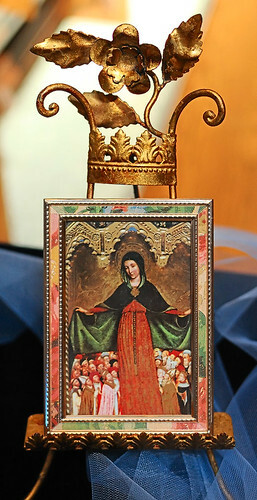 Photo taken at the National Shrine of Our Lady of the Snows. Thanks to Peg F. who assisted with taking this photo. Feast of Saint Pope Pius X. Click here for an audio lecture on Pius X, by Fr. Michael Witt. Birthday of my grandmother Erika Abeln (1901-2004), R.I.P. Also see this article on The Martyrs of Otranto, whose self-sacrifice prevented the Turks from getting a foothold in western Europe following the fall of Constantinople. These 800 were martyred on the vigil of the Assumption defending the Faith. I took this photo at Saint Francis de Sales Oratory's convent, which is now undergoing extensive restoration in anticipation of the arrival of new religious Sisters. 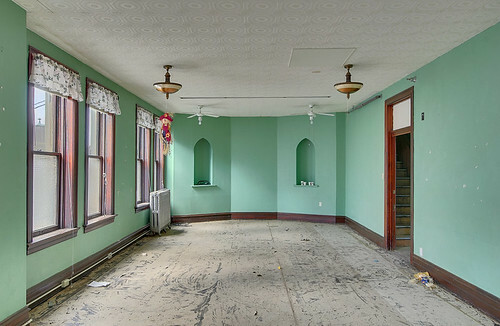 For an article on the restoration, which is being aided by a generous donor, click here. 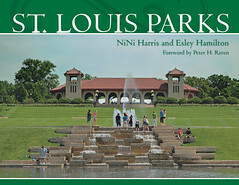 MEET FATHER William Barnaby Faherty, S.J., author of the book Catholic St. Louis: A Pictorial History, and me your servant, at the Missouri History Museum (Jefferson Memorial) in Forest Park, on Sunday, August 23rd, at 2:00 p.m. I will be giving a presentation on the book, and you can meet with Fr. Faherty, purchase copies of the book, and get them autographed. Since Fr. Faherty is very popular, our last event together was standing room only, so I suggest you get there early. We will be in the Lee Auditorium about 45 minutes before the presentation if you would like to chat. Click here for a map to the museum. 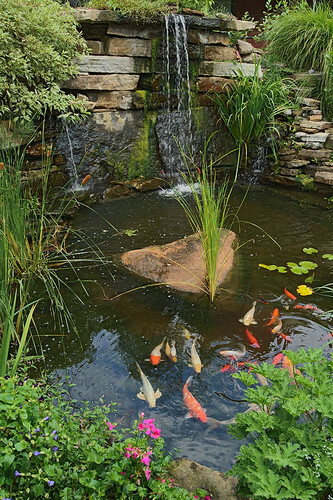 Fishpond, at McGurk's Irish Pub, in the Soulard neighborhood of Saint Louis. 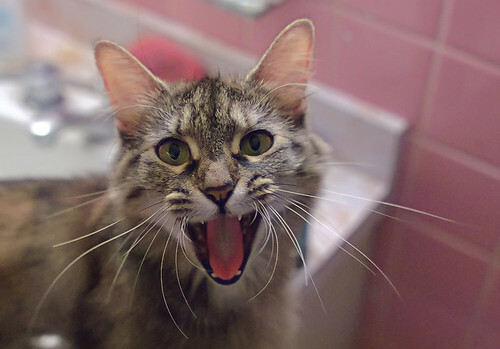 One of my cats really wanted attention last night. 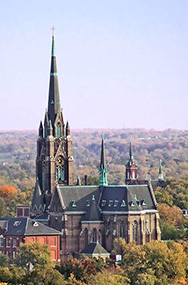 The city of St. Louis has a regal connection which goes back to the year 1297, when King Louis IX was proclaimed a saint by the Catholic Church. By naming the new city after Saint Louis, the early settlers placed their new community under the patronage of a great king and saint. It is a tribute to their hopes and dreams that they wished to appropriate the saintly attributes for themselves and all future residents of this emerging city, and that they wished to ask for the saint’s intercessory prayers and protection. The feast day of King St. Louis, the patron saint of our city, is August 25. It is customary, just as it was for the early French explorers and settlers, to reflect on the qualities which make a saint a saint, and to make a festive celebration on his feast day. 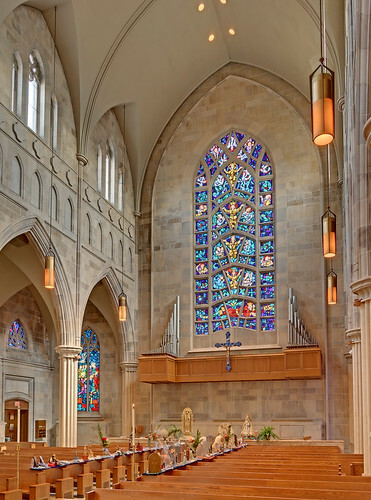 On the weekend of August 22nd , we at St. Francis de Sales Oratory invite everyone to join us in a celebration to honor King St. Louis and to introduce all comers to the Oratory. Only a few years ago the Oratory was in danger of being closed and razed to the ground. 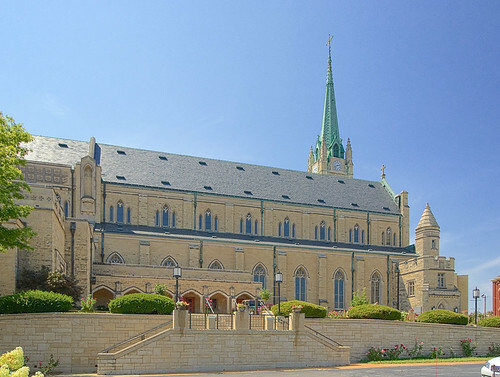 Thanks to the vision of Archbishop Raymond L. Burke, the church and the surrounding campus with several buildings were preserved and entrusted to the Institute of Christ the King Sovereign Priest so that it may bring new life to the church and neighborhood. A return to the best elements of tradition – family, genuine friendship, respect for cultural history, and religious values – is the motivation for our efforts here. St. Francis de Sales was once a center of both religious and social life for its members, and it is again. On Saturday, August 22, from 11:00 a.m. to 7:00 p.m, in celebration of this occasion, we are bringing back to life a tradition of festive summer bazaars and sizzling barbecues. The courtyard between the Church and the school will be transformed into a garden setting. Activities for children (face painting, clowns, games, etc.) and adults (silent auctions) will be held, while hourly drawings will be held for “attendance prizes.” A variety of refreshments will be served, including the Knights’ famous barbecue. The music group Jazzwind will entertain in the courtyard. On Sunday, August 23, the External Solemnity of St. Louis of France, after the 10:00 Mass, the Knights will again be in the courtyard between the church and the school, serving their barbecue. 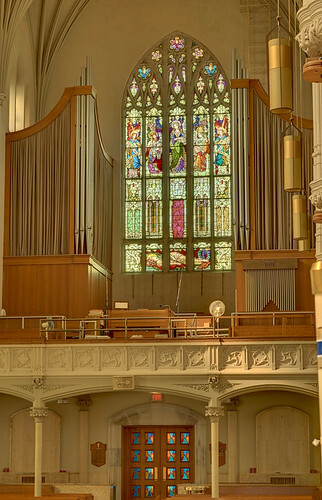 Organ recitals inside the Church, as well as music from Jazzwind outside, will be performed. 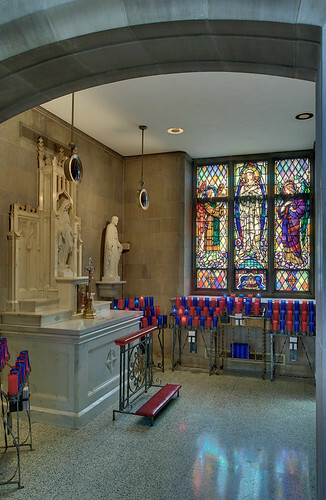 In support of the Oratory’s on-going restoration efforts, your generous support of this endeavor will be greatly appreciated. 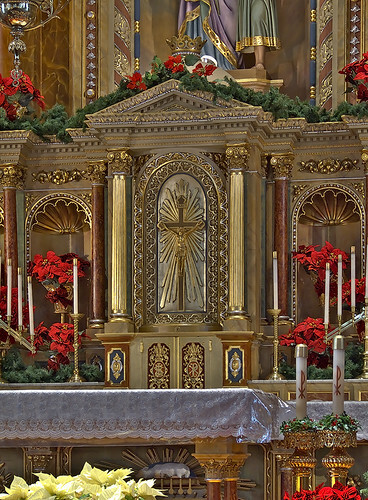 Come join us, get to know us, and together, let’s honor the patron saint of St. Louis. 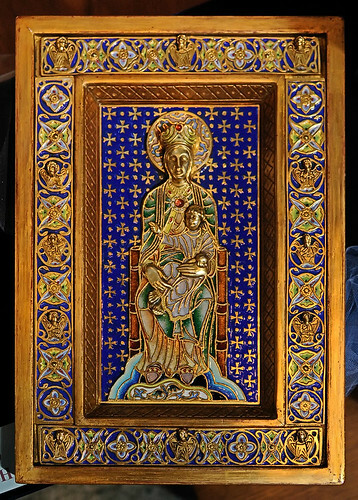 ON THE FEAST of the Assumption, the Cathedral of Saint Peter of the Diocese of Belleville hosted an exhibit of Marian art on loan from the Marianum Pontifical Institute in Rome, Italy. These are just quick snapshots of a selection of the sacred art, but I hope you enjoy them. Stone-polychrome statue "Nuestra Senora", made in Spain. 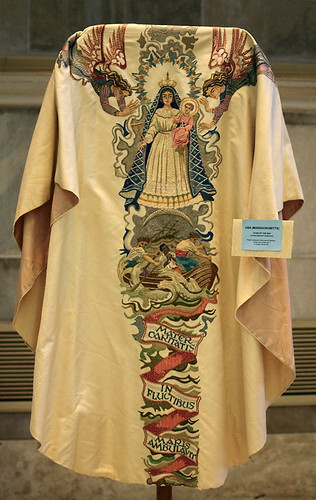 Embroidered vestment "Star of the Sea", made in Massachusetts, USA. 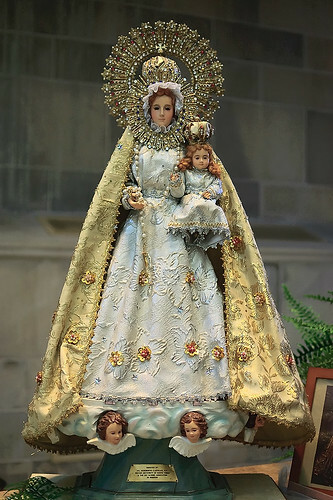 Statue made of porcelain, cloth, and gems, "Our Lady of the Philippines", made in the Philippines. 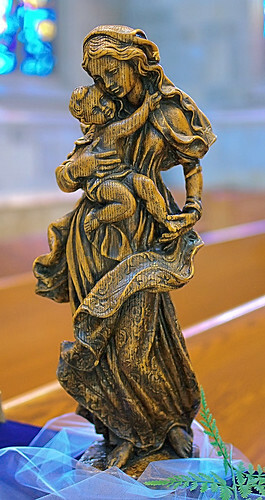 Wax statue "Madonna and Child", made in Illinois, USA. 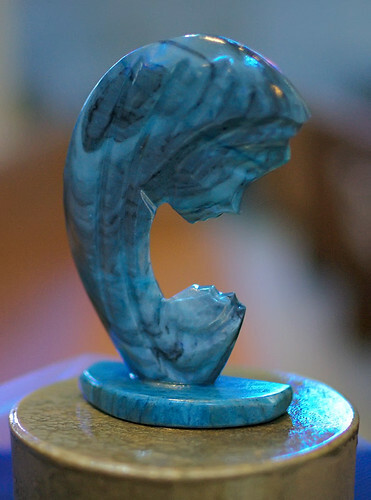 Marble, "Figure in Profile", made in New York, USA. 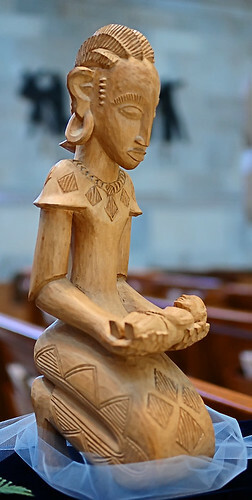 Carved statue, "Mother and Child", made in Kenya. Brass, "Mariazell", made in Austria. 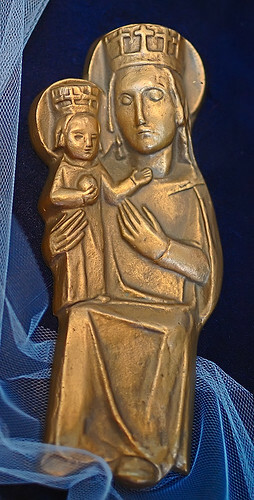 Plaster statue, "Our Lady of the Broom", made in Croatia. Hand painted wood eggs, made in Ukraine. 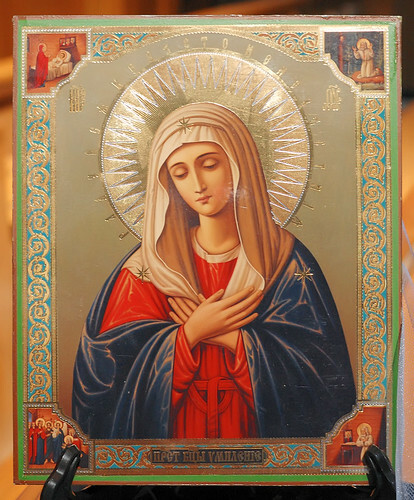 This and the previous photo are reproduction icons, from Russia. 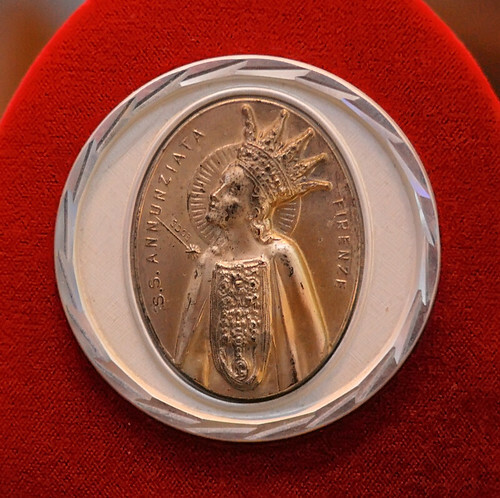 Silver mounted medal, "Fiducia mia : My Confidence", made in Italy. 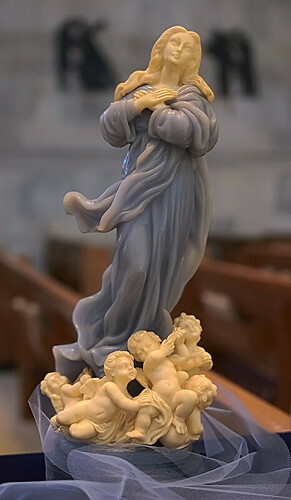 Alabaster statue, "Our Lady of the Assumption", made in Florence, Italy. 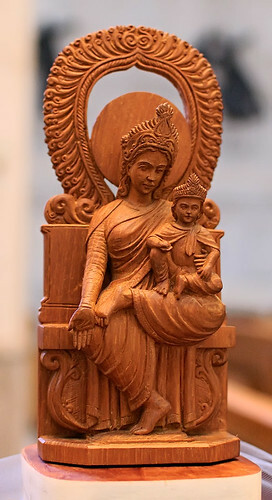 Sandalwood, "Woman Enthroned", made in India. 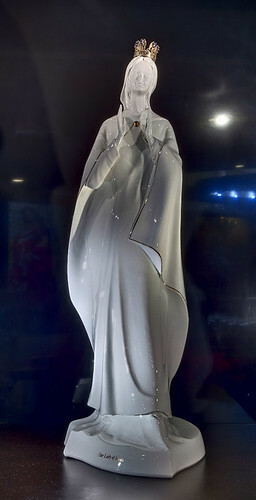 Hand carved statue, "The Holy Mother", made in China. Reproduction of the wood carving "Ravensburg Schutzmantel", made in Germany. This is my favorite — it almost breaks my heart. Enamel, "The Enthroned", made in Spain. 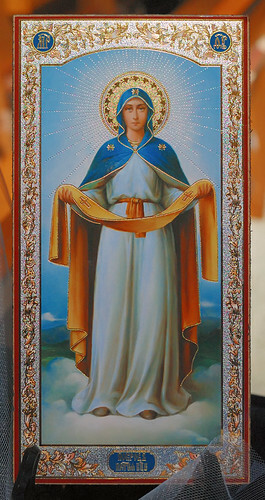 Print of painting, "Mother of Mercy", made in France. 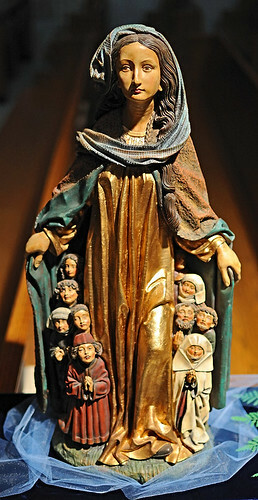 17th century carving, "Immaculate Assumption", made in Luxembourg.